Transparent or slightly opalescent solution. over the 12th week of pregnancy. extraction of the placenta, after delivery of stillborn foetus. – after multiple delivery the number of doses equals the number of babies. –	2 one-time doses (300 μg) in Rh negative women in the 28th week of pregnancy, who have no anti-D antibodies detected with the papain and antiglobulin tests. The GAMMA anti-D 150 product should be administered intramuscularly. In the case of coagulation disorders, when intramuscular administration is contraindicated, Gamma anti-D 150 may be administered subcutaneously. The place of injection should be protected with tampon compression. If a large dose of the product is required to be administered intramuscularly (over 5 ml), it is possible to be administered in doses divided for various sites. Do not use with diagnosed hypersensitivity to any ingredient of the product. Must not be administered intravenously. Must not be administered in newborn babies. Must not be administered in Rh positive (D+) women. The patient should be observed for at least 20 minutes after administration. If anaphylactic response symptoms occur, the administration should be stopped immediately and appropriate medical procedure should be applied. Real hypersensitivity response occurs rarely, but reasons of allergic nature may occur in reaction to administration of anti-D immunoglobulin. Patients should be informed of early symptoms of hypersensitivity response symptoms, including: rash, generalized urticaria, heaviness in the thorax, decrease of pressure, wheezing respiration and anaphylaxis. Treatment depends on the cause and severity of adverse reaction. In the case of shock, you should follow effective medical procedures. 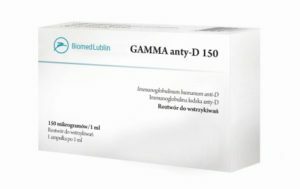 Gamma anti-D 150 is made from human plasma in persons of high anti-D antibody titre. 	testing of a plasma pool for the presence of genetic HCV material. with the use of model viruses. Measures taken considered as efficient regard capsule viruses such as HIV, HBV and HCV. However, they can have a limited significance in terms of non-capsule viruses like HAV and/or parvovirus B19. There is evidence from clinical research confirming no transmission of infections with the hepatitis virus A and parvovirus BI9 during the use of immunoglobulins. It is also assumed that the presence of antibodies plays a significant role in the virusological safety of the product. It is recommended for the patient’s benefit, if only possible, to note down the name and batch number of the Gamma anti-D 150 product with other patient data after each use to maintain the correlation between the product batch number and the patient. Interactions of the GAMMA anti-D 150 product with other drugs were not studied. The information included in this point were obtained on the basis of written sources and current guidelines. Active immunization with the use of vaccines including live viruses (e.g. measles, mumps, rubella, varicella) should be differentiated for 3 months after the use of anti-D immunoglobulin, because anti-D immunoglobulin may weaken the efficacy of vaccines including live viruses. If it is required to administer anti-D immunoglobulin within the period of 2-4 weeks after vaccination with a vaccine including live viruses, the efficacy of such a vaccine may be compromised. After the use of anti-D immunoglobulin a temporary increase in passively transmitted antibodies may occur, leading to false-positive results of serologic tests for the presence of antibodies, e.g. Coombs’ test in newborn babies. The product is used during pregnancy. The product is used in the period of breast-feeding. Gamma anti-D 150 has no influence on ability to drive and use machines. In the case of intramuscular administration of anti-D immunoglobulin pain and compression tenderness may occur in the place of injection. The following occur rarely: fever, malaise, headaches, skin reactions and shiver. Nausea, vomiting, decrease in pressure, tachycardia as well as allergic and anaphylactic reactions were observed in single cases, characterised by dyspnea and shock symptoms, even when the patient did not show any hypersensitivity reaction after previous administration of the product. Viral safety, see point 4.4. There is no data concerning overdosage of the product. Gamma anti-D 150 includes specific antibodies (IgG) against antigen D (Rh) of human erythrocytes. During pregnancy and especially during delivery erythrocytes may enter the mother’s circulation. If the mother’s blood group is Rh- minus and the foetus’ is Rh- positive, the mother may become allergic to the Rh(D) antigen and produce anti-Rh(D) antibodies, which in turn permeate the placenta and may cause haemolytic disease in newborn babies. Passive immunity to anti-D immunoglobulins prevents immunisation of Rh(D) in over 99% of cases, on condition that a sufficient dose of anti-D immunoglobulin is administered early enough after the exposition to Rh(D)- positive erythrocytes of the foetus. The product’s dose protects about 7 ml of positive blood cells from the immunising effect. The product administered intramuscularly in a woman up to 72 hours after delivery or miscarriage prevents her from the creation of anti-D antibodies, thus preventing from haemolytic disease of newborns in her next pregnancy. The mechanism of anti-D immunoglobulin by stopping the immunisation of Rh(D)- positive erythrocytes is unknown. The stopping effect may be connected with release of erythrocytes from the circulation before they reach an immunocompetent position or it can be connected with the mechanism of immunologic complex creation pertaining to the recognition of an alien antigen and its presentation by appropriate cells in a proper place with or without the presence of an antibody. After intramuscular administration, the detectable titre of antibodies can be observed after about 4 hours. The titre usually occurs after up to 5 days. The half-life period in the recipient’s circulation with a normal IgG level is 2 weeks. A given half-life period may differ in each patient. IgG antibodies and complexes of IgG antibodies are destroyed in the cells of the reticular-endothelial system. Laboratory animal tests (on guinea pigs and white mice) showed that product Gamma anti-D 150 is not toxic. Storage in the temperature of 2°C – 8°C (in refrigerator). Ampoules should be stored in the outer packaging in order to be protected from light. 1 ml of the solution in a type I glass ampoule – 1 per package. The product should be administered intramuscularly by a physician or nurse. Before use the product should be brought to room or body temperature. You should make sure that the solution in the ampoule is transparent or slightly opalising. A solution that is unclear or that has sedimentation must not be used. Any unused product or waste material should be disposed of in accordance with local requirements.